Thoughts on "Ticket to Ride: USA 1910 Expansion"
I've previously written about our positive experiences with the boardgame Ticket to Ride (released 2004), as well as its first official expansion, Mystery Train (released 2004). Now we'd like to talk about the USA 1910 Expansion. 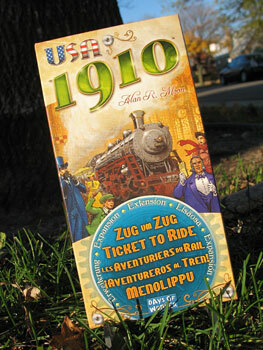 In short, if you own the original Ticket to Ride game, then you MUST pick up the USA 1910 Expansion (released 2006). It's that simple. Why is this a requirement? Because compared to any other enhancement to the game, the USA 1910 Expansion not only "fixes" some of the game's perceived flaws, but also adds entirely new life and strategy to the base game… not bad for the $15 retail price! 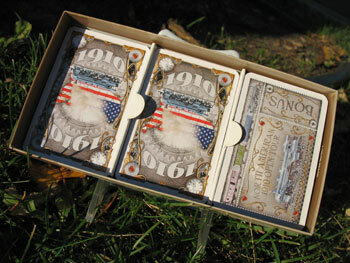 The USA 1910 Expansion is really nothing more than a box of cards. Yup, that's it. A bunch of cards. Excited yet? But it's amazing how this box of cards greatly improves the game and makes it more fun. The "1910" name refers to the historical period of the game. You see, the setting for the original Ticket to Ride is 1900… thus this expansion is supposed to indicate growth in the railroad world 10 years later. Or something like that. Believe me, the year doesn't really matter. All you need to know is "1910 = Good". So, what do you get with this box of 181 cards? First of all, you get a complete replacement set for the teeny, tiny cards that originally came with the game. The new set comes in a larger size more on par with the dimensions of a standard playing card deck. If you've ever struggled with the small cards that came with the game, the larger-sized USA 1910 Expansion is worth picking up on this basis alone. (It should be noted that all other versions of Ticket to Ride use the larger card size; only the original game still has small cards). So, you get a whole bunch of cards… some old, some new, all bigger in size. What can you do with them? Well, you can play with your original set of cards from the standard game you are already familiar with. But what fun is that? You'll really want to be playing these 3 variants instead! Your original game of Ticket to Ride came with 30 Destination Tickets. After playing a few times, you probably are getting familiar with them. I mean, it's pretty easy to guess when someone is building the route from New York to Los Angeles, right? This is one of the best variants and the one I usually use when introducing Ticket to Ride to folks for the first time. 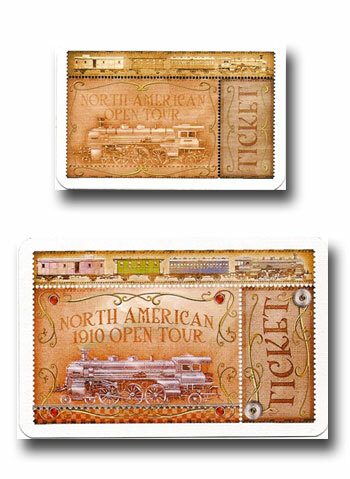 Basically, take the 30 original Destination Tickets (plus the 4 reprinted from Mystery Train) and add them to the 35 new 1910 Destination Tickets. What you have in the end in a stack of 69 destinations… plus the 2 Bonus Cards (Longest Route and Globetrotter). What this does is really encourage you to take more Destination Tickets during the game (and thus earn more points). Because there are now so many possible routes, the odds are higher that any new Destination Ticket you take will be close to a route you may have already built. It also makes it quite a bit easier to complete destinations because there are so many additional options. It's a huge plus! This variant is ideal if you want to add a little more cutthroat gameplay to your Ticket to Ride experience. It also "tightens up" the board quite a bit for 2 player games. 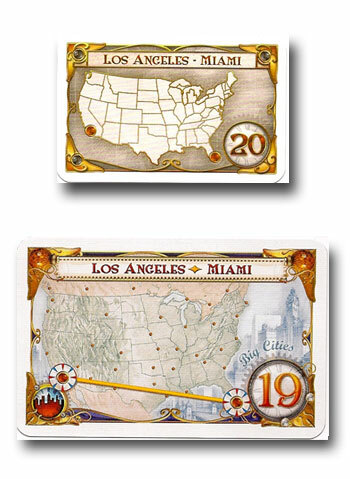 In this variant, you use all the Destination Tickets from the deck that are labeled "Big Cities"… there are 35 total – 15 from the original game and 20 from the expansion. 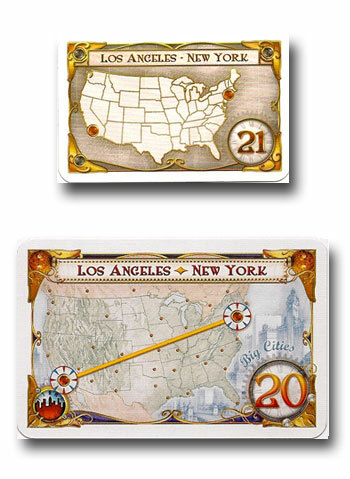 What these cards all have in common is that each features at least one of the "Big Cities" as part of the destination. These are Chicago, Dallas, Houston, Los Angeles, Miami, New York, and Seattle. Now, if every Destination Ticket goes through one of these cities, then you can easily see how there will be some fightin' for routes to connect them… and the hopes that you won't get cut off. Amy & I play this game when we are looking for more of a challenge. The strategy is also quite different because the Big Cities variant uses NO Bonus Cards. So forget all about Longest Route and the like. Just build! 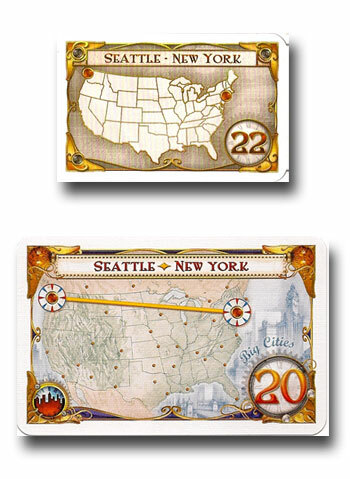 With the original game of Ticket to Ride, a common winning strategy was to build across the country horizontally (i.e. West-East), taking advantage of the longer routes for more points, mostly found in the western side of the map. Connect a bunch of these together and you often will claim the Longest Route Bonus Card… and will probably win. However, if you were dealt Destination Tickets that were found on the eastern side of the map, or involved routes that were more vertical (i.e. North-South) in nature, you didn't really stand much of a chance. The USA 1910 Expansion changes all that. First of all, by including the new Globetrotter Bonus Card, connecting lots of shorter routes is rewarded. If you have many low-value Destination Tickets, there is now a benefit to completing them, as you may earn 15 bonus points at the end of the game for having the most Tickets fulfilled. This bonus is higher-valued than the standard 10 point Longest Route and can change your strategy quite a bit. Now it actually is possible to succeed by connecting a lot of shorter routes on the eastern side of the United States map. Additionally, the influx of many new routes through the addition of 35 new Destination Tickets (pretty much a doubling of the deck) offers improved chances to score points on routes you may have already built, or at the very least, give you the option of building more shorter routes to counteract a couple long routes that other players may have. 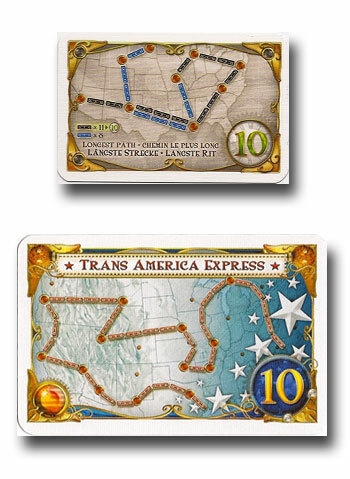 You will recall when I wrote about the Mystery Train Expansion — the first officially released extension of Ticket to Ride — that the primary motivator was to encourage players to take more Destination Tickets. The original game, while not hugely flawed, did seem to penalize you more often than not if you took more Tickets… mainly by offering a limited selection of Destination Tickets, thus resulting in routes you could not finish and in turn, negative points at the end of the game. Mystery Train attempted to fix this problem by introducing Character Cards that provided players with special "powers" to help out their point total. Thus, you were encouraged to take more Tickets in order to hopefully receive these extra powers. The success of that approach was questionable. Instead, the USA 1910 Expansion simply solves that problem by changing the odds of the Destination Tickets by giving you a wider selection. The probability that you will receive Destination Tickets that you can use positivity is improved in this expansion. Again, it balances the game out more than the original version by providing more value in the Destination Ticket deck. The Mystery Train Expansion contained 10 new cards to shuffle into your Destination Ticket deck… 6 Character Cards with "powers" and 4 standard Destination Tickets. Combined, the "mystery" was that you didn't know which type you were going to pick… a Character or a standard Destination. If you pulled a Character Card, great! However, if you didn't, the Destination Tickets were of such low value (2-7 point range) that if you couldn't complete them, they weren't going to harm your score too much. Thus it was worth the risk to pull these new Mystery Train cards. 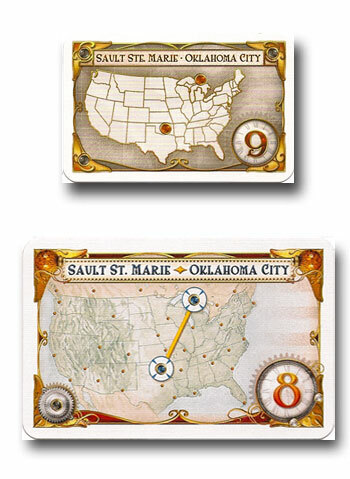 In the USA 1910 Expansion, the Character Cards from Mystery Train are gone, but the 4 low-value Destination Tickets are now part of the new deck… they are even labeled as having origins from the old Mystery Train Expansion. 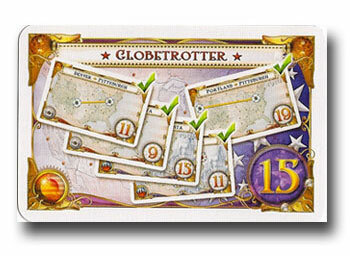 These provide 4 new cards that are easy to complete due to their low score, which is beneficial if you are working towards the 15 point Globetrotter bonus at the end of the game. I won't hide the fact that we really like Ticket to Ride. The original game is rather expensive (~$50) so spending money on something like expansions can seem questionable. However, if you are looking to spice up the appeal of the original game or even some rule changes to make it seem more attractive, consider picking up the USA 1910 Expansion. I've found that we play the original game almost exclusively with these new cards since the improvements to the gameplay actually make this a far better game to introduce to friends and family. Heck, for only $15, the larger cards are worth the price alone!